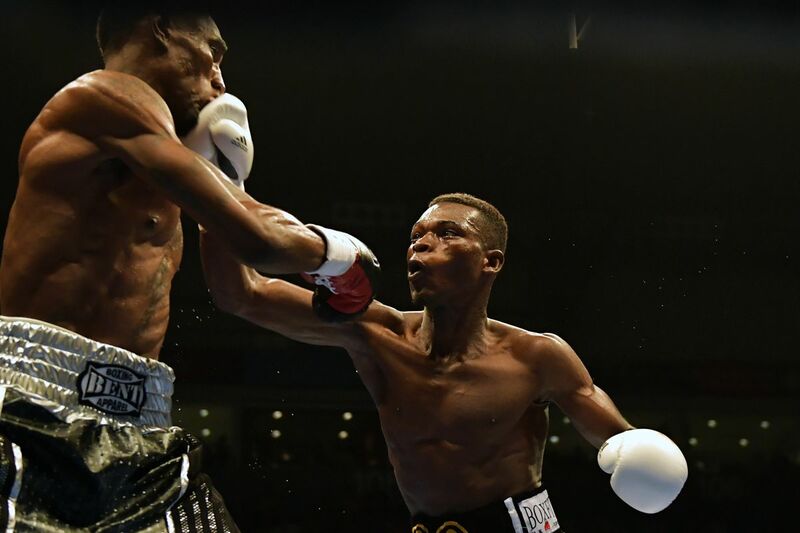 Ghana’s Richard Commey, for the past three years the subject of the sport’s intrigues particularly against dangerous African fighters, is a lethal weapon. No wonder even some so-called great fighters use every trick outside the ring to avoid getting inside the ring with the Andre Rozier ward. In his first fight under the tutelage of the champion-trainer, the final eliminator for Easter’s belt in March last year, Commey TKOd previously undefeated Alejandro Luna on the undercard of the Mikey Garcia-Sergey Lipinets world title fight at the Freeman Coliseum in San Antonio, Texas. The IBF then scheduled Easter’s mandatory against Commey on or before March 30, 2018. Yet, the Easter Camp pulled rank and clout and managed to get IBF to sidestep the mandatory, the sanctioning body rather condoning the breach, then sanctioning the Garcia-Easter unification for July 28, 2018 on condition the winner would make the mandatory defence against Richard Commey. Once that commitment was not heeded by the Garcia camp, the unification result should have been invalidated, and Garcia forced to forfeit the purse, and the title declared vacant! Yet, alas! In an attempt to save face, the IBF kudosed Garcia in a letter, reminding him of his obligation to face mandatory challenger, Richard Commey, in the immediate aftermath. As it turned out, Garcia cruised to an easy payday, putting on a clinic in an embarrassing one-sided apology of a fight that made mockery of the supposed contest, never mind combat. After scoping out Garcia from ringside, the ferocious Ghanaian slugger could not get more excited at the prospect of realising his dreams of winning the world title once he put to bed his next victim, Mexico’s Yardley Armenta Cruz at the Nassau Coliseum, in New York. Yet, even before that event, Garcia threw down the gauntlet to IBF welterweight king, Errol Spence, Jr, who was at the unification ringside, in a clear chess move. In response, the IBF wrote to Team Garcia that in the event of a Commey win over Cruz, “Negotiations should commence immediately and be concluded by August 30, 2018″ anticipating that should that fail, it would “call for a purse bid”. Exactly a week later, on August 4, 2018, an unruffled, even if frustrated Commey pummelled Cruz into submission in R2. As anticipated, the two camps couldn’t agree by that deadline. Duly, the IBF called for purse bids. All that while, a Spence-Garcia showdown was all the rage, consuming the imagination of most media, promoters and networks, given the potential financial windfall to all concerned. On Wednesday, October 3, 2018, ESPN reported, inter alia, that “Garcia opted to fight Commey, and on Tuesday (October 2, 2018) morning the IBF notified its registered promoters via email that the purse bid scheduled for Tuesday (October 2, 2018) at noon ET was canceled because the Garcia and Commey teams made a deal in what came as a mild surprise. They made their deal late Monday (October 1, 2018) night. Yet, again, an Houdini act took place! Garcia took fright, then took flight from that flight!! In a published report dated Wednesday, October 31, 2018, ESPN reported, among others, that ” … the sanctioning body … gave both sides the usual two weeks to provide signed contracts. While Commey promoter Lou DiBella submitted one on Commey’s behalf, Garcia never did”. Breaking down that statement, it is as clear as daylight that Garcia ducked Commey! First of all, the negotiation deadline of August 30, 20i8 had already elapsed. IBF had then opened pursed bids, following which both camps negotiated a deal, on Monday, October 1, 2018, two days after the deadline, following which the IBF cancelled the purse bids. The excited Commey camp signed their contract within the stipulated period, whereas the frightened Garcia camp took flight from that fight, in a clear display of cowardice! Again, the IBF bungled. Instead of stripping Garcia of the title, it allowed him to vacate it, in a mocked semblance of a dignified exit. Still, it ran short of class and dignity. Well, all that’s water under the bridge, now, and the Ghanaian has the opportunity to start the new year for himself, and Ghana, whose other son, Isaac Dogboe, lost his WBO super bantam title on Dec. 8, last year. Well, who’s the opponent? Isa Chaniev. Isa who? Is he the next victim yet to be sacrificed on the altar of boxing gods for Commey to live his dream of winning the world championship?